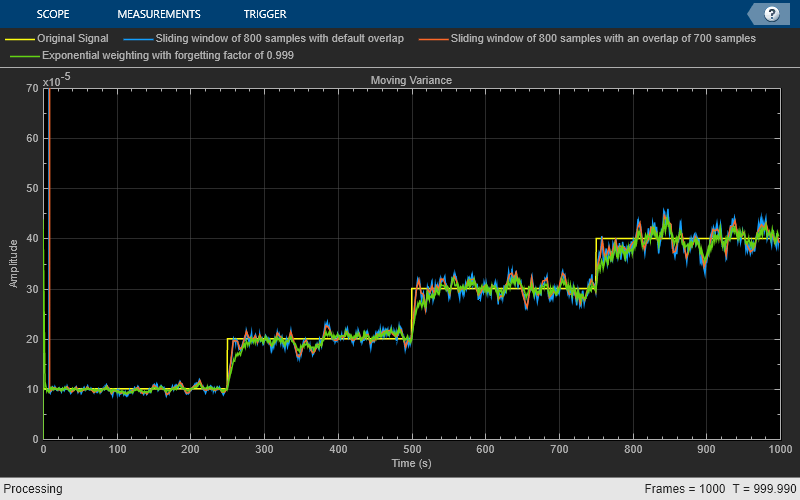 The dsp.MovingVariance System object™ computes the moving variance of the input signal along each channel, independently over time. The object uses either the sliding window method or the exponential weighting method to compute the moving variance. In the sliding window method, a window of specified length is moved over the data, sample by sample, and the variance is computed over the data in the window. In the exponential weighting method, the object subtracts each sample of the data from the average, squares the difference, and multiplies the squared result with a weighting factor. The object then computes the variance by adding all the weighted data. For more details on these methods, see Algorithms. Create the dsp.MovingVariance object and set its properties. MovVar = dsp.MovingVariance returns a moving variance object, MovVar, using the default properties. MovVar = dsp.MovingVariance(Len) sets the WindowLength property to Len. MovVar = dsp.MovingVariance(Name,Value) specifies additional properties using Name,Value pairs. Unspecified properties have default values. 'Sliding window' — A window of length specified by SpecifyWindowLength is moved over the input data along each channel. For every sample the window moves by, the object computes the variance over the data in the window. 'Exponential weighting' — The object subtracts each sample of the data from the average, squares the difference, and multiplies the squared result with a weighting factor. The object then computes the variance by adding all the weighted data. The magnitude of the weighting factors decreases exponentially as the age of the data increases, never reaching zero. false — The length of the sliding window is infinite. In this mode, the variance is computed using the current sample and all past samples. y = movVar(x) computes the moving variance of the input signal, x, using either the sliding window method or exponential weighting method. Data input, specified as a vector or a matrix. If x is a matrix, each column is treated as an independent channel. The moving variance is computed along each channel. The object also accepts variable-size inputs. Once the object is locked, you can change the size of each input channel, but cannot change the number of channels. Moving variance of the input signal, returned as a vector or a matrix. Compute the moving variance of a noisy square wave signal with varying amplitude using the dsp.MovingVariance object. Set up movvarWindow and movvarExp objects. movvarWindow uses the sliding window method with a window length of 800. movvarExp uses the exponentially weighting method with a forgetting factor of 0.999. Create a time scope for viewing the output. Generate a noisy square wave signal. Vary the amplitude of the square wave after a given number of frames. Apply the sliding window method and the exponentially weighting method on this signal. The actual variance is np. This value is used while adding noise to the data. Compare the actual variance with the computed variances on the time scope. In the sliding window method, the output at the current sample is the variance of the current sample with respect to the data in the window. To compute the first Len – 1 outputs, when the window does not have enough data yet, the algorithm fills the window with zeros. As an example, to compute the variance when the second input sample comes in, the algorithm fills the window with Len – 2 zeros. Len is the length of the window. The data vector, x, is then the two data samples followed by Len – 2 zeros. When you do not specify the window length, the algorithm chooses an infinite window length. In this mode, the output is the moving variance of the current sample with respect to all previous samples in the channel. 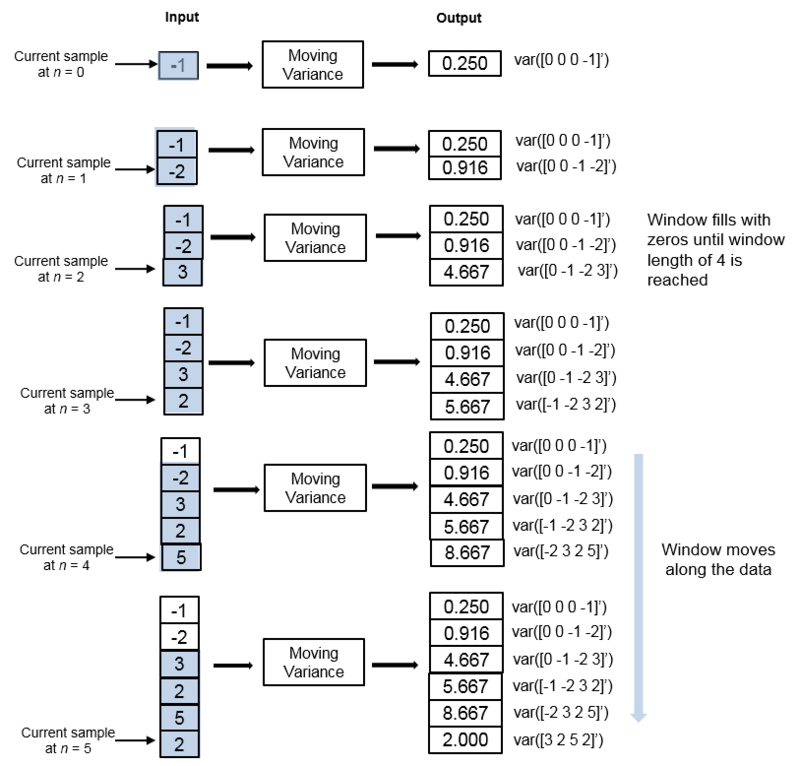 Consider an example of computing the moving variance of a streaming input data using the sliding window method. The algorithm uses a window length of 4. With each input sample that comes in, the window of length 4 moves along the data. To compute the moving variance, the algorithm implements these equations recursively. s2N,λ — Moving variance of the current data sample with respect to the rest of the data in the channel. x¯N,λ — Moving average at the current sample. For details on computing the moving average, see dsp.MovingAverage. [xk−x¯N,λ]2 — Difference between each data sample and the average of the data, squared. ∑k=1NλN−k[xk−x¯N,λ]2 — Difference between each data sample and the average of the data, squared and multiplied with the forgetting factor. All the squared terms are added. 1vN,λ — Weighting factor applied to the sum. λ — Forgetting factor you can specify through the ForgettingFactor property. As the age of the data increases, the magnitude of the weighting factor decreases exponentially, and never reaches zero. In other words, the recent data has more influence on the current variance, than the older data. 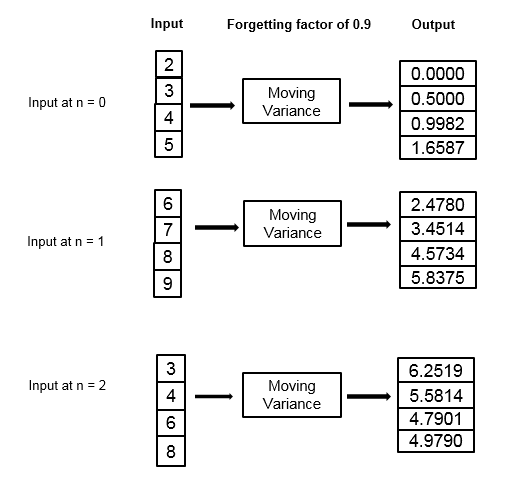 The value of the forgetting factor determines the rate of change of the weighting factors. A forgetting factor of 0.9 gives more weight to the older data than does a forgetting factor of 0.1. A forgetting factor of 1.0 indicates infinite memory. All the past samples are given an equal weight. Consider an example of computing the moving variance using the exponential weighting method. The forgetting factor is 0.9.